You are ruining the idea of light flickering. If it's continuous it's not scary, it's like "join us in the disco". Fly movement have one glitch in last frame. I personally think that you can improve characters faces, better define that ball of hair and clean them before you continue with animation. I know that hear should be messy but you should try to make it look more like hair. Lamp is great but I don't understand highlights in the middle of the pole. Is it reflection from the ground? Dithering on the ground and some parts of characters is not contributing to overall look, it just makes it look more messy, try and see how it will look without dithering, or try some other more defined form of dithering. Texture of paving is very nice. Mathias for the love of God will you explain how you did that fog. That's great stuff. Good point with the light. 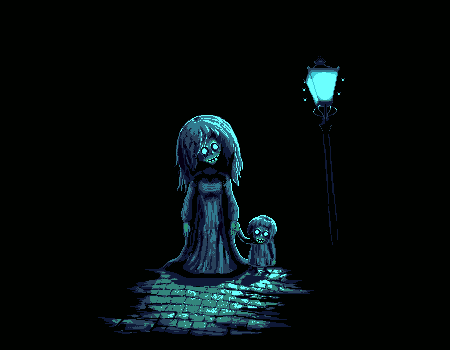 The flickering is meant to be a glitch in the lamp post's function, like it's short circuiting, or who knows, maybe it's being affected by the spooky ghost peoples' presence. Either way, if you're gonna flicker the light, you want to do it in a scary way. Just a few flashes here and there. Just enough for the viewer to be able to read the ghosts peeps correctly. I think the flickering light lends to the scariness of the scene because we as humans are more vulnerable in low light conditions; when we can't see what's in front of us we can't prepare for or defend ourselves very well. @ Daimoth - Yeah, cool, no problem. Please see my post here, in response to Fizzick who had the same question. If you still don't get it and really wanna know, post a new thread in Animation. I totally agree on the problem with "disco", haha I will reduce the flickering to a minimum when I start working on the animation-part again. Also I have done some tweaks. -The dresses were much more defined, removed random feeling pixels. -The shadows between the single stones were "fixed"
-The pavement got reduced on the right side due ugly placement of some stones -> Repairing the right side. This is turning out nicely. I do hope you animate the moths, flickering bulb and maybe add a fog effect similar what Mathias had displayed. It really amplified the spookiness overall. I think one more lighter blue around the streetlamp too just to make the aura pop out a lil more. I will of course animate this. However I am not sure about how the moths should move. Sadly it seems like I wont add a fog effect. It is too hard to do it properly. skip to 1.10 for dat alpha fog! Really neat idea! I will take a look into that! Thanks!